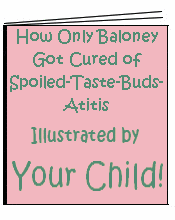 An Excerpt from "How Only Baloney Got Cured of Spoiled-Taste-Buds-Atitis"
...and other generally yucky stuff. Kids are kind of picky, but grown-ups eat lots of stuff, right? That means that most kids, as they get older, learn to eat more and more different foods. As Only got older, he started eating less and less different foods. First he stopped eating things that are good for you. Then he stopped eating things that were kind of good for you. After awhile, he would only eat baloney sandwiches. That's right: baloney sandwiches. For breakfast, for lunch, and for dinner. Only Baloney was eating only baloney. "Try the noodles," said his mom. "Have just one bite of the potatoes," said his dad. But Only just made his yucky face. You see, Only began to love baloney sandwiches so much that he stopped wanting to eat any other foods. Why eat noodles when he could eat baloney? Why try a bite of broccoli when it didn't taste as good as the baloney sandwich?! Only loved baloney sandwiches so much that he forgot about all the foods he had once liked. In fact, he started to believe that all those foods were now yucky! That's what can happen when you eat the same thing over and over and over. Do you know what "good nutrition" is? It's "healthy food that's good for you." Now, if those baloney sandwiches had all the good nutrition Only needed to grow up big and strong, it wouldn't have been such a big deal. But there isn't a food in the world that's so good for you that you don't need to eat other foods too. Also, lots of times, the yummiest foods are the ones that aren't so good for you. That's why we just eat them some of the time and call them "treats." When you eat treats all the time, they stop being treats and stop tasting so good! Only's parents tried to get him to eat other stuff beside baloney sandwiches, but when they did he would cry. Sometimes he said, "I'll die if I eat that!" So they ended up giving in and letting him eat only his baloney sandwich. Pretty soon Only Baloney started feeling pretty bad. When he played tag with his friends he was always "It," because he couldn't run as fast as them anymore. His stomach hurt real often and things started making him cry a lot easier. It was no fun when kids started calling him "crybaby" at school. It was no fun when they picked him last for teams at recess and in gym. But Only didn't know why all this was happening, and neither did his parents. Finally, they took him to a doctor. The doctor stuck a flashlight in Only's ear and a popsicle stick down Only's throat. He looked under Only's eye and hit Only's knee with a funny hammer that made Only's leg jump. Then he asked Only, "What do you eat?" When Only told the doctor that the only food he ate was baloney sandwiches, the doctor looked at Only's parents. They nodded their heads and said, "It's true. That's all he eats." The doctor shook his head. He said, "Your son has spoiled-taste-buds-atitis." These are the first 8 pages of the picky eater pictureless picture book (that your child illustrates and learns from). Would you like to give your child the book and the opportunity to improve a problem behavior? This downloadable ebook that your child illustrates costs only $2.99 US. Click the button to purchase. You'll be taken to PayPal, a secure site. After you've paid, you'll be returned to this site for your book and simple instructions on getting the best results from it. Back to the picky eater page.